As promised on Tuesday, my pictorial guide to Germany's robust attitude to safety continues with examples from the railway. In fair Düsseldorf, as in so many cities worldwide, the old dockyard area is being developed into something rather trendy. Naturally, in the past it was criss-crossed by railway lines, most of which - but by no means all - have been grubbed up. But the means of access to the remaining tracks is entirely accessible by trains which, were they to trundle down the slope from the main line, would g reatly surprise the pedestrians, cars and indeed new buildings, which are in no way protected from anything trundling down the line, were such a contingency to strike. Not even a level-crossing any more. 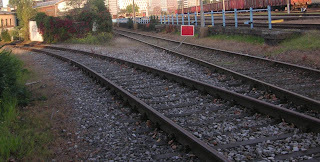 In the pic above, a marks a track that has been grubbed up and is now a public footpath (note its unprotected proximity to the main line): b is a disused track that is still in situ, connected to frequently-used lines by perfectly serviceable points to the right of the photo; and c is a track still in constant use by goods trains - big buggers, hauling (inter alia) coal, and oil tankers. The interesting one is b, which splits a little further on into two serviceable tracks, both also in use as footpaths that run downhill, unhindered, into the old dockyard area. The area that's now trendy and well-frequented. Did I say unhindered ? Well, not quite. The right-hand branch is adorned by this small red tin square on a stick. The left-hand branch has no such impediment to runaway trains. I have a feeling that this approach to life comes with, err, lower capital costs than that of our own dear Blighty. Of course, it doesn't always work out so well ... How's a chap to strike a balance, eh ? I suppose a lot of it depends on line speed and how pissed up you are. I couldn't get used to the trams sharing the roads with the cars when I was in Berlin. I took a trip to Weymouth in the 1980s and the train went (slowly) through the streets, full of cars and people, down to the Quay station. By 1996 the line was closed, so when a special used the line they had to tow parked cars away ! The old Mumbles train in Swansea also ran on the roads for the first and last part of the journey - no barriers or elf'n'safety. Now that should make for quite a bit of fun, Nick. "Oh! The continentals do this sort of thing sooo much better!" "Oh! The continentals do that sort of thing soo much worse."